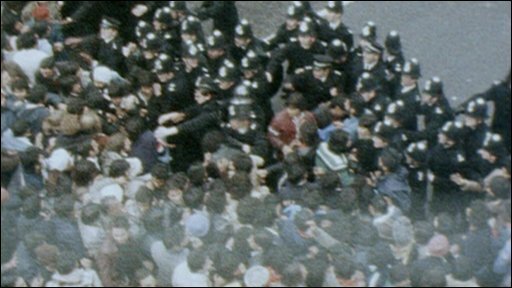 A police officer is likely to have "struck the fatal blow" which killed a protester in west London 31 years ago, a Scotland Yard report reveals. Anti-racism activist Blair Peach died after he was hit during a protest in Southall in April 1979. The previously secret report attaches "grave suspicion" to an officer, who it says may also have been involved in a cover-up along with two colleagues. But the Metropolitan Police said no officers would face further action. Mr Peach's family have long campaigned for the report - written by Commander John Cass - to be released. His partner, Celia Stubbs, said the report "totally vindicated" what the family had always believed. The Cass report into the death of Blair Peach is not a dry internal police review document. But we may never discover which one of the unnamed officers struck the fatal blow - and Blair Peach's family say they have never expected a prosecution. What they wanted, at the very least, was openness and recognition that an officer killed the teacher. Police chiefs say modern policing is accountable and the release of the Cass report is a symbolic moment to that end. The death will remain a key point in a political battle over police reforms - but campaigners are now looking at the death at last year's G20 protests of Ian Tomlinson. Prosecutors have spent more than six months looking at the evidence - but are yet to make a decision on any charges. "I never really expected a prosecution. I don't regret that, I am just pleased that we have the report so we can see what happened on the day," she said. A Met statement said: "We have gone to great lengths to ensure that all investigative options currently available have been exhausted. "To this extent the Crown Prosecution Service (CPS) has provided us with independent advice stating that there is nothing which would currently justify carrying out a further investigation." Mr Peach, a 33-year-old teacher from New Zealand, was taking part in a demonstration against the National Front. The protest led to clashes with the police and he was later found with fatal head injuries. A police radio or truncheon is thought to have delivered the fatal blow. The Cass report does not name any of the implicated officers, but said six were on board a van belonging to the now disbanded Special Patrol Group identified as carrier U.11. It said there was insufficient evidence to charge anyone over the death but recommended action for perverting the course of justice for three officers, and there was "grave suspicion" over one of them, only identified as "Officer E". Cdr Mark Simmons: "One can't read the report without a sense of deep discomfort"
The 1979 report said: "Whilst it can reasonably be concluded that a police officer struck the fatal blow, and that that officer came from carrier U.11, I am sure that it will be agreed that the present situation is far from satisfactory and disturbing." It went on: "The attitude and untruthfulness of some of the officers involved is a contributory factor. "It is understandable that because of the events of the day officers were confused, or made mistakes, but one would expect better recall of events by trained police officers. "However, there are cases where the evidence shows that certain officers have clearly not told the truth." Officer E, Officer F and Officer H "clearly obstructed" police officers carrying out investigations, it added. The Met said the names of the officers had been removed from the report for legal reasons. 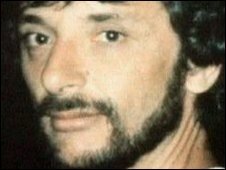 A spokeswoman said: "Some of the information has been redacted to prevent the identification of members of the public and police officers who contributed to the investigations into Blair Peach's death." One of the officers on duty that day, Alan Murray, told BBC News he believed he was Officer E. But he denied the allegations in the report, describing them as a "total distortion and a disgrace". The former Scotland Yard inspector, 59, who led a unit of the Special Patrol Group at the demonstration and is now a Sheffield University lecturer, says none of his officers was involved. Last year, Metropolitan Police Commissioner Sir Paul Stephenson said the report should be published after being reviewed by lawyers. The Crown Prosecution Service (CPS) completed that review and advised Scotland Yard that charges could only be brought if there was sufficient new evidence, such as a confession. Sir Paul said the report made "uncomfortable reading" and it was a matter of "deep regret" the police had been unable to provide Mr Peach's family with a "definitive answer". "As a police officer with over 34 years service reading and being briefed on the investigation reports leaves me feeling deeply uncomfortable," he said. Following a death in the course of police work, forces these days are required to immediately refer the case to the Independent Police Complaints Commission for investigation. 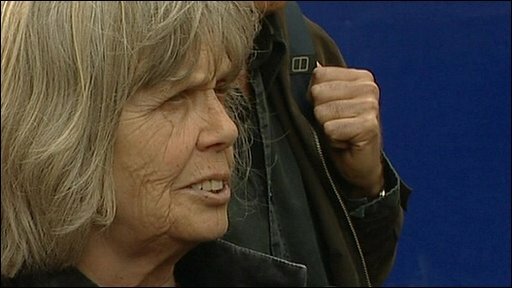 Deborah Coles, of campaign group Inquest, called upon Sir Paul to publicly acknowledge that a Metropolitan Police officer was responsible for the fatal blow on Mr Peach. At an inquest at the time, the jury returned a verdict of "death by misadventure". Mr Peach's family felt sure the Met investigation, conducted by a team of 30 detectives under Commander Cass in the force's Complaints Investigation Bureau, held the key to the truth behind his death.